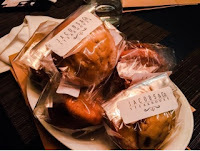 After five years, Jacob & Co. has improved. Possibly I was younger during my first visit: the 40+ menu items relating to steak was daunting and the three minute spiel explaining the menu even worse. During that visit, something grated me about how I was told, “The Chef will be cutting the steak to ensure it’s served at its optimal level.” As if I’ve never wielded a knife before! Most likely, it’s because I deviated from my true love, a Black Angus bone-in rib eye, and succumbed to the waiter’s suggestion for a Japanese wagyu instead. Prized and expensive? Sure. Tender? You bet. But, I’m not 90 years old yet, I can certainly chew through an aged steak. The wagyu, in my opinion, is all fat without the bloody meaty flavour. It’s still delicious, but in small quantities. After being persuaded back for a family dinner, I’m glad to have returned. The menu is still as extensive, but I dutifully scanned for the bone-in rib eye options (there was only one). The spiel was equally long but the server brought up thoughtful suggestions about sharing and creating a “steak-tasting” menu. And thankfully, he did not end with explaining how the Chef couldn’t trust me to cut my own meat. Instead, on this visit, I fondly remember the hot cheddar rolls that were as airy as Yorkshire pudding, flaky as croissant and buttery as brioche. 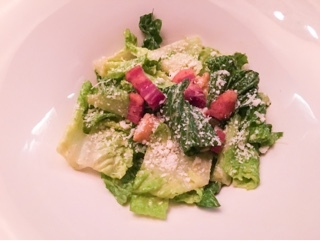 The Caesar salad ($19; enough for two), prepared table side, which provided an element of showmanship. 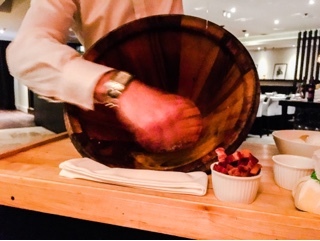 At Jacob’s they tip the bowl on its side so guests can watch as each ingredient is added and whisked. It’s well worth the wait: the freshly made dressing isn’t overly creamy but rather adds a slick richness to the romaine. 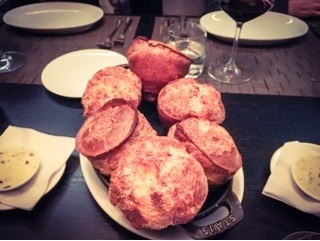 Moreover, none of the individual ingredients are overly represented, instead well balanced blend of flavours. You get the slight brininess of the anchovies, richness of the yolk & olive oil and tang from the garlic, but they’re not competing with each other. Only the bacon bits had the potential to overwhelm the salad, but since they were more cubes than bits, I ate them on their own anyways. Yet, it’s the shared 24 oz. bone-in rib eye ($108) from Hereford-Guelph, a city just down the 401, which I’ll remember the most. Here I thought Alberta reigned supreme with steaks, but Ontario can certainly hold its own. 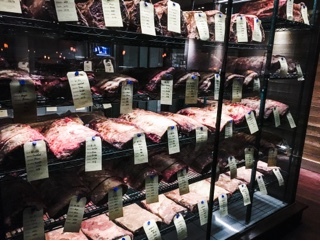 Indeed, it could have something to do with aging the meat for 60-days; the room filled with meat currently undergoing to process proudly displayed on the second floor, not unlike a wine cellar. The steak was fantastic! Filling the mouth with flavours before almost melting away with each bite. It had such a beautiful caramelized crust despite the centre being a vivid reddish pink. Here, our server was helpful – explaining that the restaurant first sears the meat, lets it rest until cool, before finishing it off in a hot oven to avoid overcooking. That extra middle step was critical. 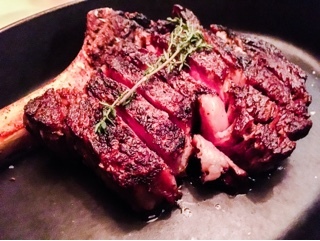 On a return visit, I may even branch out into the other bone-in cuts (a T-bone or Porterhouse). Having a slice of a fellow diner’s PEI T-Bone ($113), it was equally succulent and I liked how you get two tastes in one: the meaty sirloin and smaller tenderloin cut. 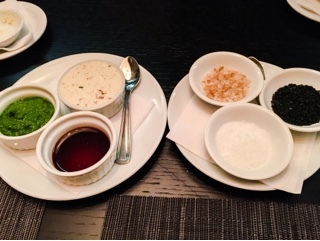 Our table was filled with condiments for topping the steak: a Danish blue cheese with bacon, chimichurri, Japanese shoyu, oak smoke, fleur de sel and crushed black pepper. I tried a forkful of the chimichurri (delicious and thick) but left everything else. For such prized meat, you want to taste the melding of fat, blood and juices – why cover such delicious meat with other strong flavours? After all, we’re not having some everyday unaged skirt steak here. 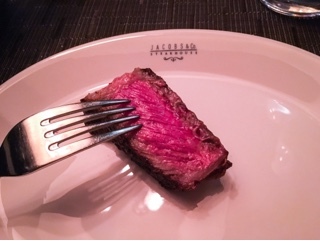 Like most high-end steakhouses, a $100+ steak won’t even get you a potato. So, we added a bunch of sides to share. As soon as the chef’s special of lobster poutine ($13) was uttered, we knew the duck fat fried potatoes would be substituted. 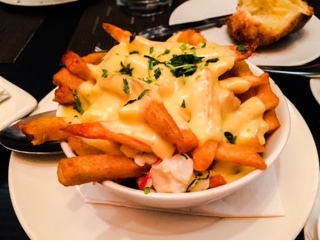 Jacob’s poutine consisted of dense rich fries smothered with hollandaise, cheese curds that were sadly not melted, but made up by sweet pieces of lobster. I commend Jacob’s for automatically adjusting the size of sides to the table. 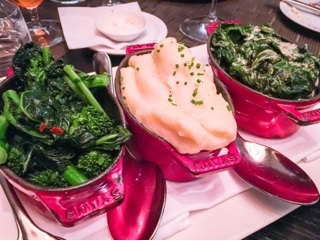 For our group of six, we also ordered sautéed rapini ($8), potato puree ($8) and creamed spinach ($7). Our server provided (and charged us) for the half orders, which was more than enough to satisfy. To finish our wine, my husband and I shared the cheese plate ($14) - a nice varied selection of crystal laced Blackout Beemster, creamy Chateau de Bourgogne triple-cream Brie and not overly strong Bleu d’Elizabeth semi-soft blue cheese. 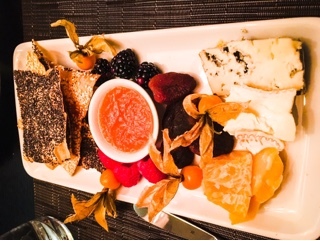 The small plate could barely hold all the lavish crackers, dried apricots, fresh berries and compote that accompanied the dairy. 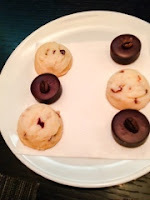 The petite fours, which arrive with the bill, left me with the sweet ending I needed … one last bite of flaky shortbread before leaving. Dining at Jacob’s is more than just a one-meal affair. 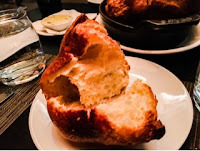 They leave you with chocolate chip muffins to enjoy the next morning – which they bake fresh before dinner, giving the dining room a lovely fondue essence. Although, truth be told, I wouldn’t have objected to a cheddar bun instead… because, man, those were good.